I mixed two tints of LH351D 90CRI (3000K and 5000K) emitters to create a more consistent and closer to BBL tint. It’s about 4100K and the emitters make it more floody than SST-20, 219B or XP-L HI. It has a hot spot still but it’s probably twice as big of a hot spot as the 219B. It does just over 6,000 lumens at turn on in this configuration. It is a “gun grey” version 1 with mixed ice blue and purple aux LEDs. I took it apart and fixed the MCPCB and replaced with much better MX-4 thermal paste. It has all the optic legs in tact, no stripped screws and works perfect. why is this still for sale? Cuzz nobody bought it yet. maybe…. Does this have the same interface as the regular e07? What does Version 1 mean? It has the same interface, yes. Version 1 refers to the first production batch of E07’s. It had some issues with the copper LED board not sitting flush which I have fixed and is probably better than the new ones. They also had some assembly issues with the optic and screws in the first batch but mine was assembled correctly from the start. The only real difference between this and the second batch is the cooling fins on the side are slightly beveled in the second batch. On this light the cooling fins are squared off and a little sharp on the edge. 2nd batch is 1mm longer too to fit more batteries. It will probably not fit the over sized Lishen 21700 that comes re-wrapped from many different brands. That was a big issue because Fireflies sold Lishen 21700’s and (fake) Samsung 40T’s that were actually the same out of spec Lishen battery to go with this light. Dang, I wish I had waited a few hours before ordering a new one from FF, then I would have seen your ad. I paid $80 with DHL shipping and Nichia 219B emitters, and although the manufacturer has promised to fix the thermal paste issue in this second generation version, it would have been nice to know for sure that the flashlight had gotten a real QC check from a hobbyist skilled at modding who actually took the time to look it over and fix it up. Someone needs to buy this so I dont have to. PM sent. Waiting for reply. Ya’ know… sometimes you win, sometimes you loose. With the purchase of this light………… I Win!! . . Thanks contactcr… I am inpressed!! . .
Glad you like it! It’s a very cool light having the multi color aux LEDs and the mixed CCT main LEDs, just works. Yep… it really is nice!! 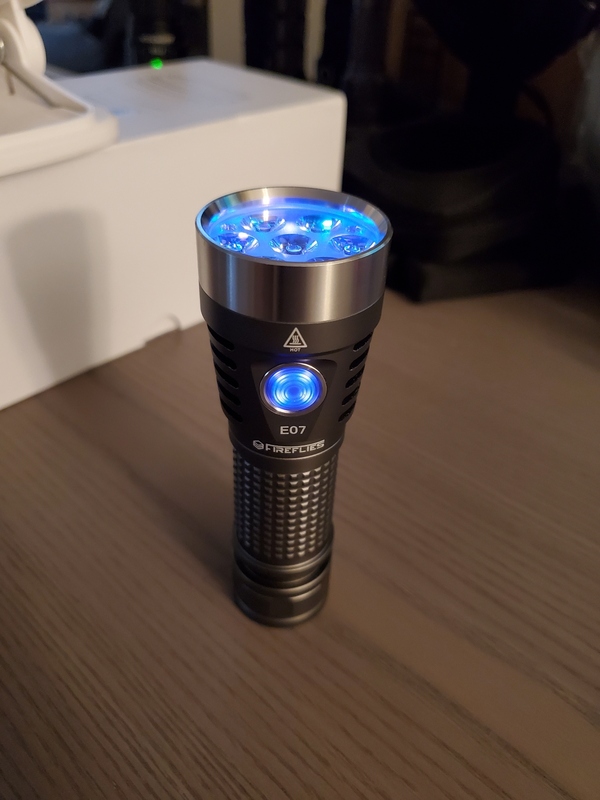 These are my first LH351D 90CRI Emitters & I really did not know what to expect tint wise… I thought it might be a somewhat ‘greenish’ tint maybe. Not this mix of 3000K & 5000K….. it is nice!! And yeah… the Aux LED mix is great. Teacher, there is a difference in tint between the 70 CRI W6 power bin and the 80 CRI U6 power bin… I find the W6 to be a nice smooth white and noticeably brighter. 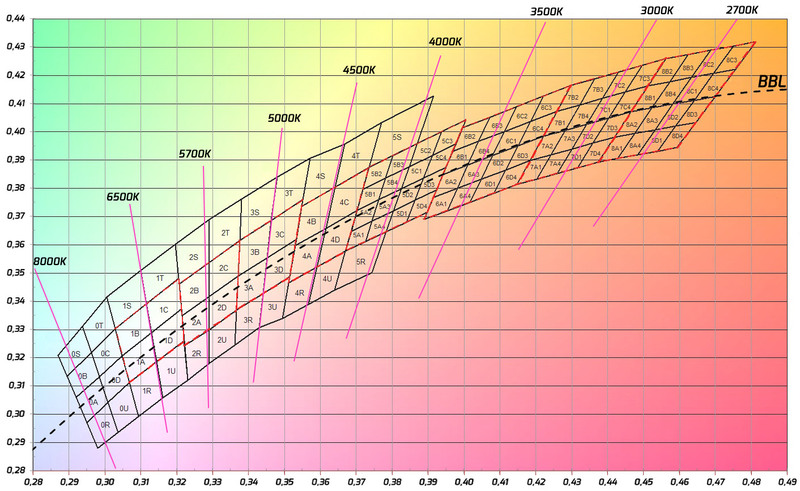 The U6 is a bit off in color, in spite of the higher CRI rating. Just this morning I built a quad X6 using the Noctigon 32mm MCPCB and Angie optic (Emisar D4S) and the output was too much a lemony color, but one piece of Lee minus one eighth filter does wonders! Essentially, C mixed tints to get approx where this one is now, and the look is really neat too! Nice catch, enjoy! Thank you for explaining that DB Custom. . I think I am really gonna like this one. Cant wait till it gets dark tonight…..